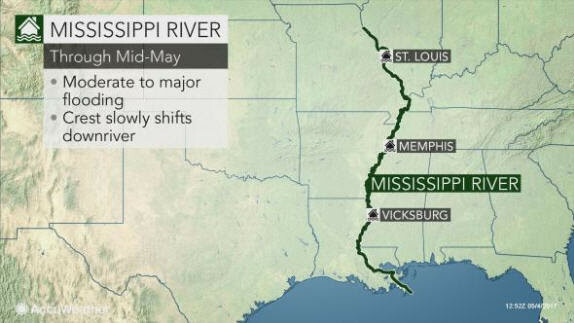 AccuWeather-(ENEWSPF)- AccuWeather reports as a surge of water continues to flow downstream, flooding will occur along the middle and lower Mississippi River through the middle of May and perhaps to the end of the month in some areas. While some areas along streams and small rivers have born the brunt of the slow-moving flooding disaster in recent days, communities along the Mississippi River from Missouri and Illinois to Louisiana and Mississippi will be racing against rising water over the next couple of weeks. The larger the stream, the longer it takes for flooding to cycle through. Small creeks in mountainous or hilly areas can flood in a matter of minutes and hours, while the largest rivers in nearly flat terrain sometimes take days and a week or more for water to drop below flood stage. Torrential rain from the last weekend of April set the flooding disaster in motion. During late April and early May, record flooding occurred at some locations, including along the Black river at Pocahontas, Arkansas; Current River at Doniphan, Arkansas; Meramec at Sullivan, Steelville and Eureka, Missouri; and the Gasconade at Hazelgreen and Jerome, Missouri. Levees in some communities were breached or topped by high water levels. Rainfall during the middle days of this week brought a second surge and crest along small streams and tributaries of the major rivers. This new surge of water will also prolong the rise and recession of the Mississippi River and lower portions of the Missouri, Illinois, Ohio and White rivers. The high water levels will continue to impact river navigation and port operations. This weekend, the Mississippi River at Cape Girardeau, Missouri, will crest near or just shy of the record of 48.9 feet set on Jan. 2, 2016, according to data compiled by National Weather Service hydrologists and the United States Geological Survey. At St. Louis, where some highways have been closed due to high water, the Mississippi is not expected to drop below flood stage until the middle of next week. Farther downstream, a crest at major flood stage is forecast at Osceola, Arkansas, later next week. At Memphis, Tennessee, while only minor flooding is forecast, the Mississippi River may remain above flood stage from the middle of next week to beyond the middle of the month. Areas farther south along the Mississippi River in Arkansas, Mississippi and Louisiana may not experience a crest until the third week in May. River levels in some portions of these states will reach moderate flood stage and may not drop below flood stage until nearly the end of the month. Meanwhile, a portion of the Black River in northern Arkansas may remain above flood stage into early next week. Areas along the White River in Arkansas will experience major flooding through this weekend. Waters along the White River may not drop below flood stage until the third or fourth week in May. It may take many weeks until flooded farmland is workable, but the weather may cooperate in the short term. 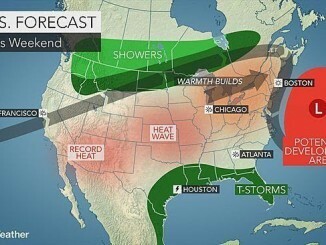 “No significant rain is anticipated to fall over the middle and lower Mississippi Valley from this weekend through the middle of next week,” according to AccuWeather Lead Long-Range Meteorologist Paul Pastelok. The extended rain-free weather will help some communities with damage assessment and cleanup operations, while communities over the lower Mississippi will have fair weather to prepare for the flooding to come. 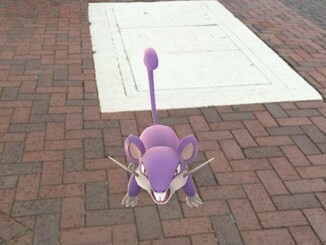 Pokemon Go: Does Weather Affect Which Characters You Can Collect?